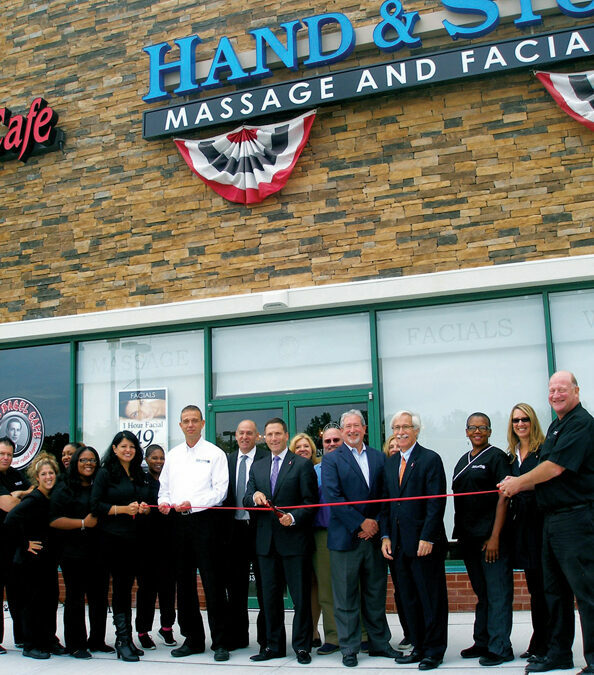 LIVINGSTON, N.J. – Oct. 13, 2015 – Hand & Stone Massage and Facial Spa recently commemorated its grand opening at The Shoppes at the Livingston Circle in Livingston, N.J. with an official ribbon cutting ceremony. The event was attended by Livingston Mayor Michael M. Silverman, Councilman Rufino “Rudy” Fernandez, Township Manager Michele E. Meade, and local dignitaries from the Chamber of Commerce and Livingston Business Improvement District (BID); the Spa’s co-owners, Jeff and Ken Silbert, and their employees; Peter Schofel, co-managing partner of Eastman Companies, the shopping center’s manager and developer; and David Perlmutter of Perlmutter Properties, who negotiated the long-term lease on behalf of Eastman. Florian Suserman of Ripco Real Estate represented the tenant. Hand & Stone Massage and Facial Spa is one of several new tenants to join The Shoppes at the Livingston Circle’s complementary lineup of retailers, restaurants and service providers. Specialty grocer The Fresh Market opened last fall in a 23,000-square-foot portion of the center’s former Pathmark store. The center also recently welcomed Choice Pet Supply and Ike’s Bagel Café. Additional tenants include Olive Garden, GameStop, Wine Legend, Milano French Cleaners, Hudson City Savings and Zen Japanese Cuisine. Located at the intersection of Route 10 and Eisenhower Parkway, The Shoppes at the Livingston Circle is situated along one of Northern New Jersey’s most desirable retail corridors. The well-maintained, well-positioned shopping center boasts exceptional highway access and visibility in one of New Jersey’s most prosperous commercial and residential hubs. For leasing information, please contact Florian Suserman at 973-496-6807 or FSuserman@ripconj.com. Headquartered in Livingston, N.J., Eastman Companies and its affiliated companies have been in business for 37 years and are recognized leaders in high-quality real estate developments with property throughout Northern New Jersey. The company boasts a portfolio of more than two million square feet of office, retail and industrial space located in Essex, Morris, Bergen and Burlington counties.